Monthly subscription boxes are becoming increasingly popular, covering a multitude of hobbies from food and fishing, to beauty and fashion. There's something for everyone. Crafty Creatives is a new monthly subscription service providing members with new and exciting crafting materials. Once a month a package will arrive jam-packed full of goodies which aim inspire you to create something unique. This month’s box had a nautical theme and included items like fish beads, starfish charms, paper string and Union Jack patterned ribbon which can be used for making jewellery or gift wrapping, as well as more unusual items such as pages from a nautical dictionary, a large square of hessian and pieces of driftwood, uses of which may require a bit more thinking! Needless to say, one of the main selling points is that they send things that you may not think of trying yourself. The box also comes with a Crafty Creatives kit, which contains the materials and instructions for you to make a small item. This month’s kit was a rope and anchor bracelet. The instructions are really clear which make it really easy to put together and require very little extra equipment. It is evident that the creators, sisters Claire and Isobel, spend a lot of time, thought and effort into lovingly compiling each box. Everything comes beautifully packaged and labeled, and all the items inside are of a high quality. 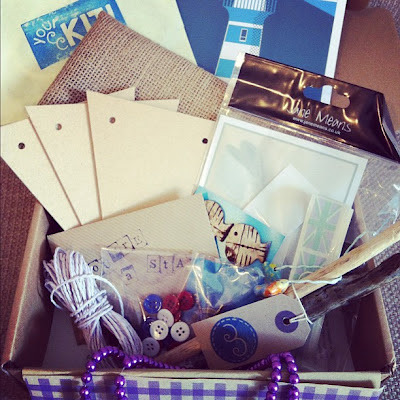 The Crafty Creatives box is £10 a month, plus £2.95 p&p. Each box so far has sold out, so get in there quick if you want to be part of this crafting revolution! Find them at www.craftycreatives.com.